In celebration of the 50th anniversary of manned space flight, Russia’s state space agencies are encouraging interest in space with a competition for kids. Who didn’t dream of becoming an astronaut as a kid? Of taking a space walk, or stepping on the moon? Half a century after the first manned flight, space travel is perceived as routine, but mankind is only just beginning to explore outer space, and an infinite number of discoveries and achievements lie ahead. The Star Race online Cosmos Olympics (www.cosmosolympics.org) has been designed to generate a new wave of interest in space exploration among young people and schoolchildren worldwide. The main site of the competition is in Russian, but the website has an English version as well. The top prize is a trip to the launch site at Baikonur to see a real spaceship head into orbit. 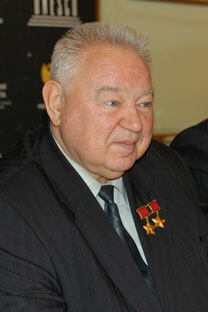 In remarks delivered in Paris at the Star Race project presentation, cosmonaut Georgy Grechko, a two-time Hero of the Soviet Union and a full member of the International Academy of Astronautics, expressed hope that the winner who witnesses a rocket launch will commit to space in both heart and mind. “When I was contemplating my career choices as a young man, I was very disappointed because I thought at the time that there was nothing left to study. People had flown across the ocean, travelled to both poles of the Earth, and dived to the bottom of the Mariana Trench. After reading Jules Verne, I realized that I could still fly to the Moon. The young people who will take part in the Olympics have a very interesting future and a lot of work cut out for them – exploring other planets. From my experience, once the Star Race winner sees a spaceship blast off at Baikonur, their heart and thoughts will forever be in outer space,” Grechko said. The contest commemorates the 50th anniversary of the first manned space flight, and will culminate on April 12, 2011, at UNESCO’s Paris headquarters. UNESCO has declared next year the Year of Cosmos and supports the initiative of the Russian promoters of the Olympics, the Federal Agency Rossotrudnichestvo and the Federal Space Agency Roskosmos. The first two online rounds of the contest are being held from December through February at www.starchallenge.org. The winners of this intellectual marathon, who, among other things, will need to demonstrate outstanding talent in such fields as physics and mathematics, will receive their prizes from the Valentina Tereshekova, the chairperson of the Olympics panel of judges and the first woman to go into outer space. The winners will also meet other cosmonauts and astronauts and visit the Yury Gagarin cosmonaut training center. In addition to the main contest, the Star Race features competitions for the best space-themed comic strip, the best essay, and the most creative question to ask a cosmonaut. Winners of these contests will receive prizes such as laptops, cameras and e-book readers. Russian President Dmitry Medvedev has declared 2011 The Year of Russian Cosmonautics, and the Star Race contest is part of an extensive space and cosmonautics awareness program among for young people aimed at promoting Russia’s image as a leader in space exploration.